I was researching a specific mining death in my village, Woolley Colliery near Barnsley and your website was the first record I found. It enabled me to go on and locate publicity from the time in local newspapers. So thanks very much. Your website really helped. I am emailing you to inform you of a couple of errors in the record you have. The death was of Johan Winkler aged at Woolley Colliery in February 1958. When I located the death notice from Johan's family, it gave his date of death as 15 Feb 1958, not 05 Feb as you have on the website. Also, Johan was 36, not 37. I am pretty sure the family record will be correct. Johan was an ethnic German although a Romanian citizen. He was conscripted into the German army in WW2, taken prisoner of war, worked in the Barnsley area as a POW, met and married a local girl and stayed on in Britain to work in the mines. John, as Johan was known, was a very popular and respected man in the village although it was a difficult time to be a German in Britain. That is testament to his own character as well as the humanity of most in mining communities. 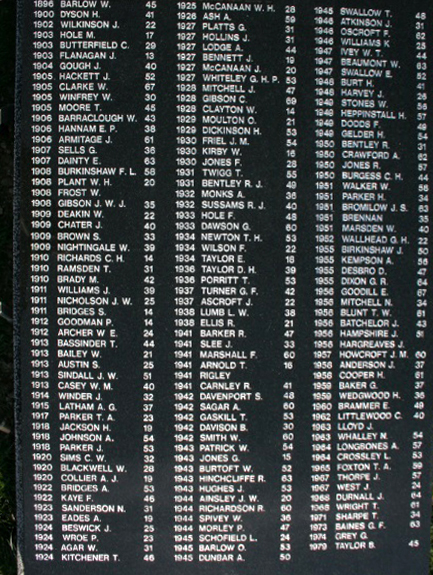 Any Info About Thoresby From 1953 To 1990 Also How Many People Lost Their Lives At Thoresby Colliery. Any information about Thoresby from 1953 to 1990. Also could you let me know how many people lost their lives at Thoresby Colliery. Hello my name is Andrew Brown I am researching my family tree which originates from North Derbyshire. Could you help with any info on the surnames Bunting, Raynes, Ashmore and Ball. Most of which were miners in the region. I remember my Grandfather giving a moving talk on his 80th birthday about how as a young man of 21 he was called to his father s bedside after the accident, and how after his father s death he had to take over as the head of the house. My grandfather, Arthur Dunbar, died as a result of an accident at Hickleton Main colliery. I don't know the date of the accident but it was sometime early July 1945. He had surgery to his hand, probably at Mexborough hospital, and died on Friday 13th July 1945. His name is on the recently erected Hickleton Colliery memorial in Thurnscoe cemetery, but his age was put as 50 years old, whereas he was a few weeks short of 47 years old. Unfortunately I never knew him, arriving myself in 1949. My great-grandfather died in 1902 following a roof fall at South Kirkby colliery a couple of days earlier. His name was Cuthbert Dunbar and came to South Yorkshire (which was the West Riding of course) in the late 1870's from the Northumberland area. The family appear in the 1881 census, living in Darfield or Thurnscoe, if I remember right. The fact that he was from the North East was mentioned in newspaper coverage of his death. 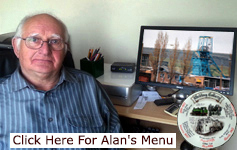 I met Bob Bradley only this week who gave me details of the excellent web site of “Healey Hero”. I have just started browsing and found your list of fatalities. Vic was crushed by moving mine cars in the pit bottom. I was assistant undermanager at the time, later undermanager, and we were all shocked by Vic’s death. The mine cars all gravitated on the pit bottom circuit, ran very quietly, and didn’t have projecting buffers, resulting in his death when trapped between two cars. Will let you know if I find any more, I became manager at several Notts pits and finished in 1995. Which colliery were you at? I am sure that I remember you from somewhere. First of all, may I congratulate you on a splendid and informative website and database. I can see its going to be a continuous source of information in my quest to trace my ancestors. During my research, it has become apparent, that many of my ancestors were miners, many of them working at Grimethorpe. One of my ancestors, Samuel George Elliff, born in 1905 is one of the odd ones out, living in Grimethorpe, but working at Bentley. 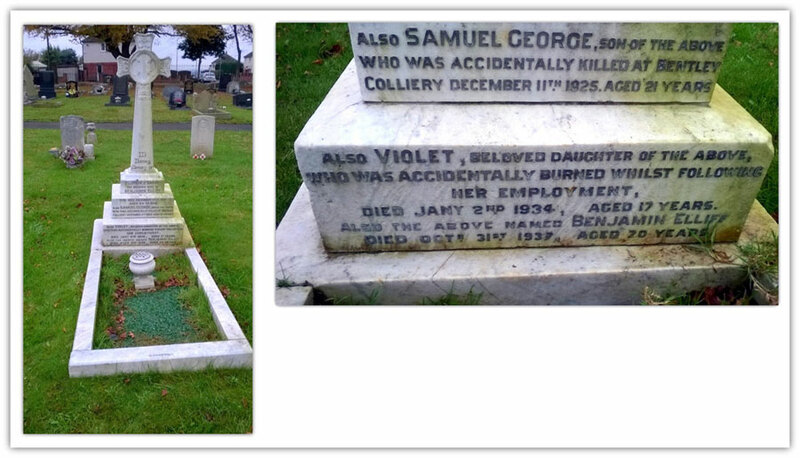 Sadly, on the 11th of December, 1925, Samuel was killed in an accident whilst working at Bentley. The records available on line with Ancestry, don t give circumstances of his death. Wishing to find the details of the accident, I was directed to your website and database. The problem I have, that I was unable to trace him. There is, however, a record of death for a man recorded as L.G Cliff aged 21, working at Bentley, crushed by tubs on the 11th of December 1925. Could this be my cousin? Have his original details been transcribed incorrectly. May I respectfully request, that you revisit the original record and check if they were right or wrong, and confirm if Mr Cliff, is actually my cousin, Samuel George Elliff. Thanks in anticipation, and again, thank you for an excellent source of mining information. I have attached a photo of the family grave at Grimethorpe. Also I have started to look at Sam s in laws today, and found from the census, many were miners. Once I have got them all together, I will be returning to your site for further research. Already, I have noticed that some died rather young. Should I come across any burial places or photos of the individuals, I will pass them on to you. Although not directly involved in the mining industry, I am immensely proud of my mining ancestors.